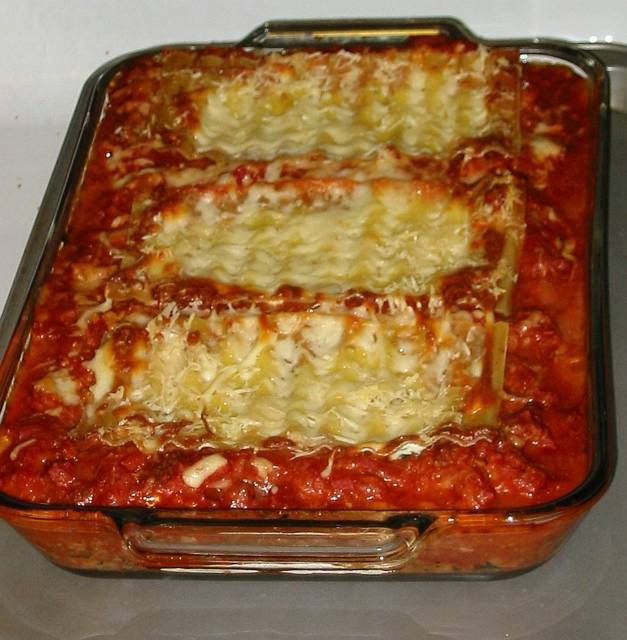 Homemade lasagna is always a favorite at potlucks or a nice dinner at home. Although it has many ingredients, the recipe is pretty hard to mess up (although I did mess up while making this one). 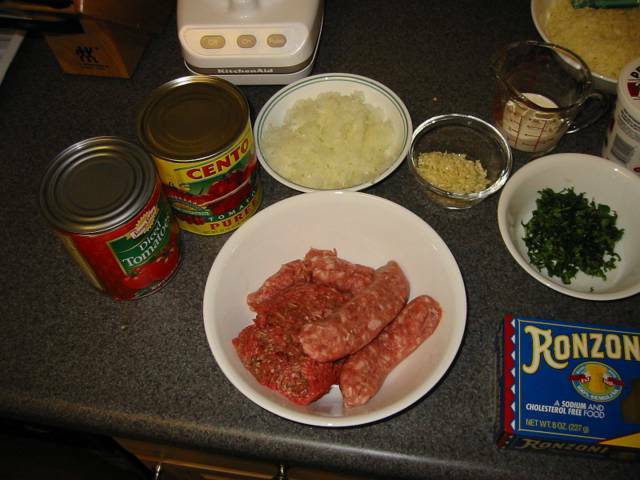 Here's my recipe for a simple meat lasagna. There's quite a few ingredients, so I took two pictures: sauce ingredients and layer ingredients. To speed things up, I use a food processor to finely chop six cloves of garlic and then a medium onion. In addition, I use a 28 oz. can of pureed tomatoes and a 28 oz. can of diced tomatoes. For the meat, I use 1/2 pound ground beef and 1/2 pound italian sausage with the casings removed. I used ground beef from the round for the illustrations because it happened to be on sale. Ground chuck is also excellent. A 1/4 cup of heavy cream is also needed for the sauce. For the layers, I use 15 oz. container of whole milk ricotta cheese, 16 oz. mozzarella, 1-1/4 cup Parmesan cheese, 1 large egg, and on 8 oz. 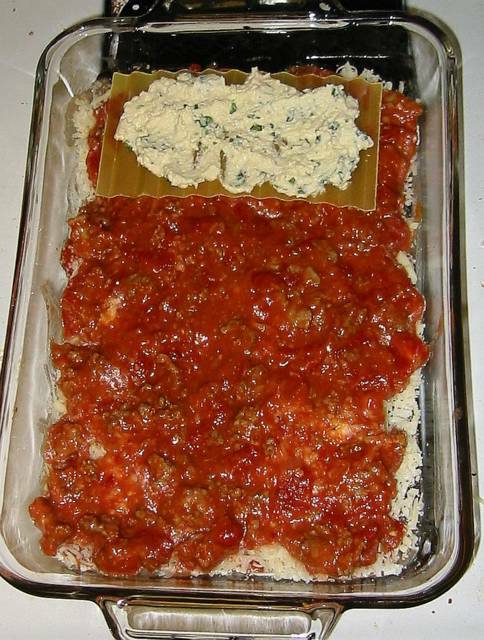 package of oven ready (no-boil) lasagna pasta. I grated the mozzarella in the food processor and used a microplane zester to grate the Parmesan cheese. Avoid using the pregrated cheeses because they are often additives that keep the cheese from clumping and make them last longer, but alter the taste. The egg should be lightly beated with a fork. We'll come back to these ingredients in a few minutes. First, heat a large pan or pot (a dutch oven works well) over medium flame. I used a six quart saute pan for this article. Pour 1 tablespoon oil into the heated pan. 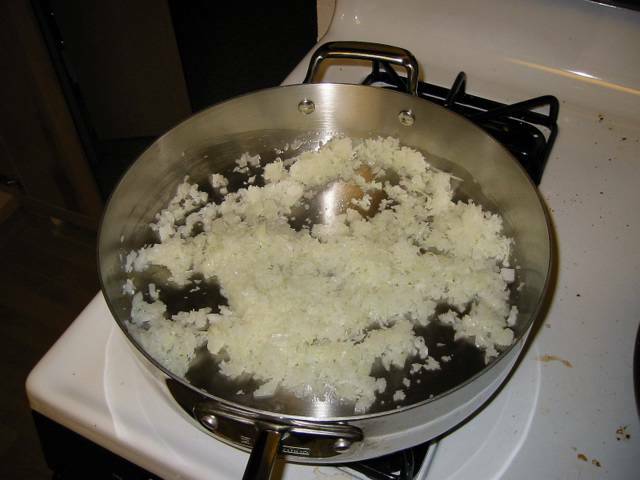 After it begins to shimmer, put the finely chopped onions into the pan. Cook for about two minutes, stirring occasionally. We want the onions to soften but not brown. Add garlic at this point and cook for another two minutes - stirring occassionally. Try not to brown the garlic. 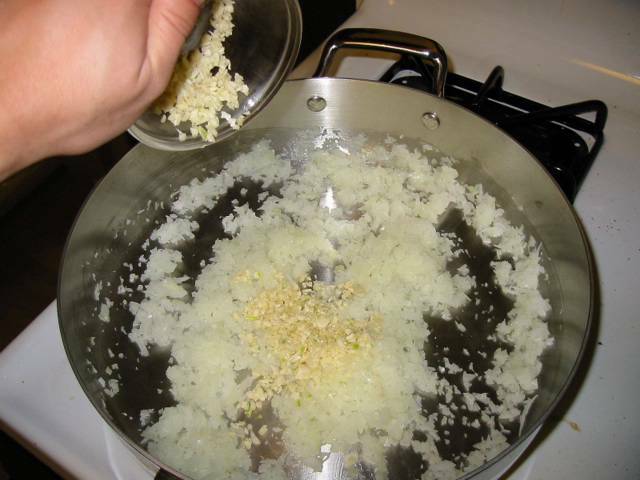 Once the garlic is fragrant, add the ground meat and increase heat to medium-high. Break up any large clumps of meat while stirring. I use a wooden spoon and just jab at any large pieces. Add salt and pepper to taste (I like about 1/2 teaspoon of each). Cook until the meat loses it's pink color, but not start to brown (about three to four minutes). 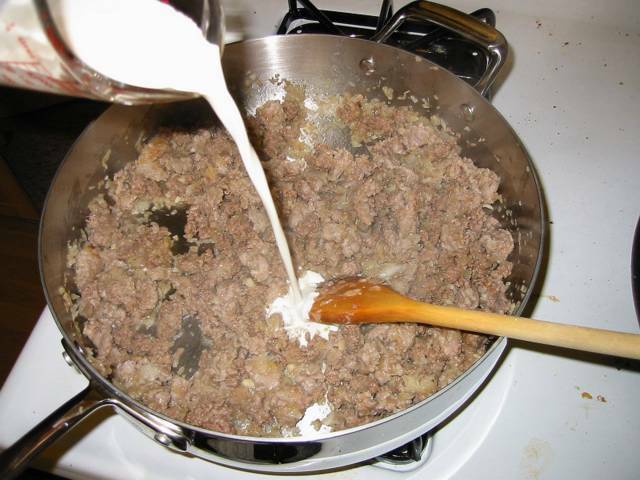 Now stir in 1/4 cup heavy cream to help hold the meats together a bit. Allow the mixture to simmer and thicken until most of the water in the cream has evaporated. Now, add a can of pureed tomatoes and a can of diced tomatoes (drained). Stir the mixture until evenly distributed and bring to a simmer. After bubbles begin to form, lower the heat to low and cook for a few more minutes. The sauce is now done and we can set this aside to work on the layers. 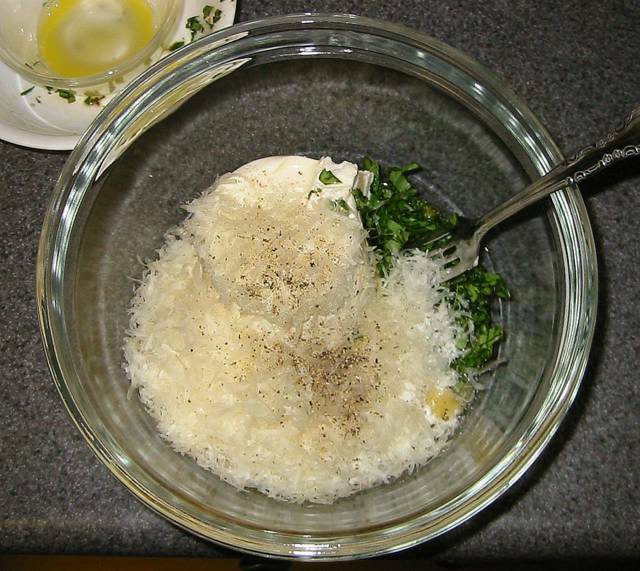 For the layers, put the ricotta cheese, a cup of parmesan (reserving 1/4 cup for use later), the chopped basil, beaten egg, and some salt and pepper (about 1/2 teaspoon each works well) into a medium bowl for mixing. 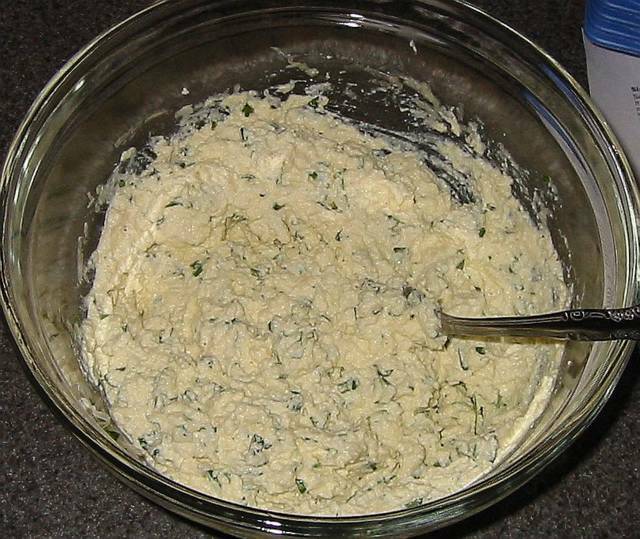 Mix the ricotta and flavorings together with a fork, spoon or spatula until it's relatively smooth. Now, we're ready to build the lasagna. Most of the time, people build the lasagna in the 13 x 9 in. baking pan, but I saw an episode of America's Test Kitchen where they prepared the layers outside of the pan. This turns out to be an easy and fast way of putting the layers together (also works if you have a helper in the kitchen - one person can prepare the layers while the other builds the lasagna). This method starts by laying out all twelve pieces of the lasagna pasta. Then spoon the ricotta mix unto each pasta piece - about two tablespoons each. 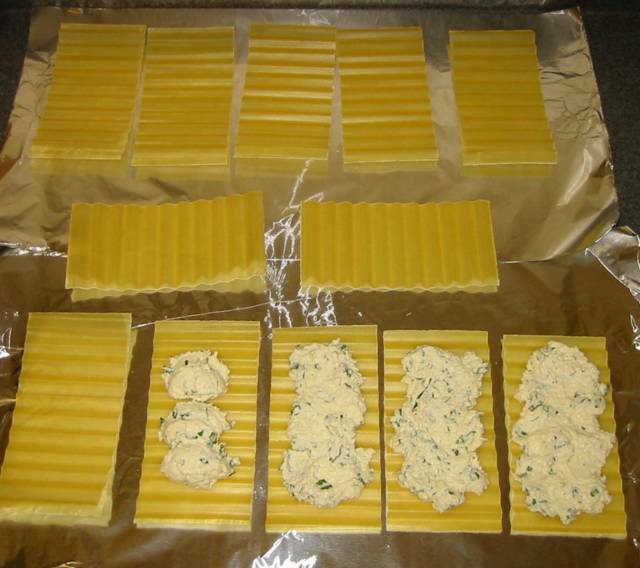 Distribute any excess evenly and flatten the ricotta onto each pasta piece. Assembling the lasagna is easy, but pay attention to what you are doing and how many layers there will be (I didn't and ran out of meat sauce because I was too liberal with it on the bottom layers). Prepare a 13x9 in. 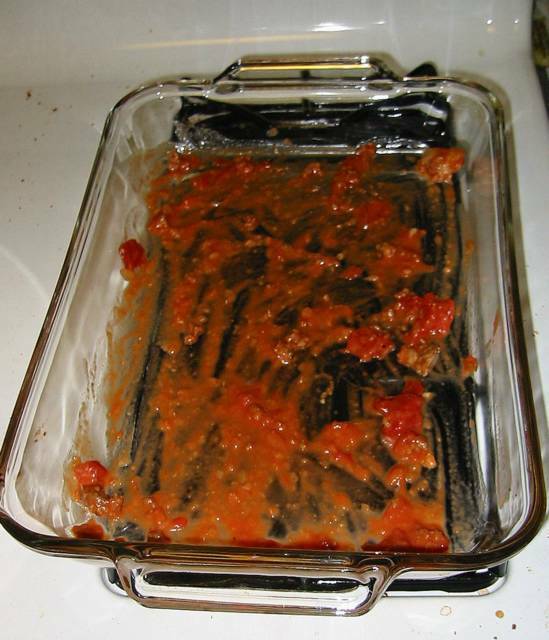 baking pan by applying a thin layer of meat sauce to the bottom, using just enough sauce to coat. Then place three lasagna pasta (with the ricotta facing up) into the pan. 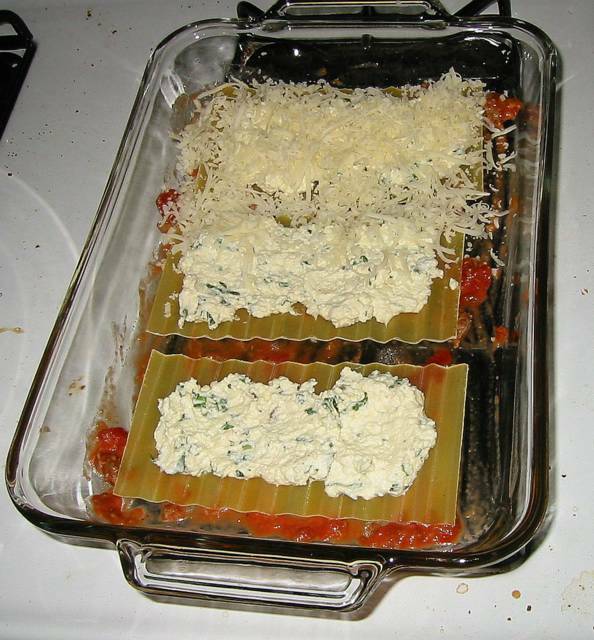 Then cover the pasta with a fourth of the shredded mozzarella cheese. 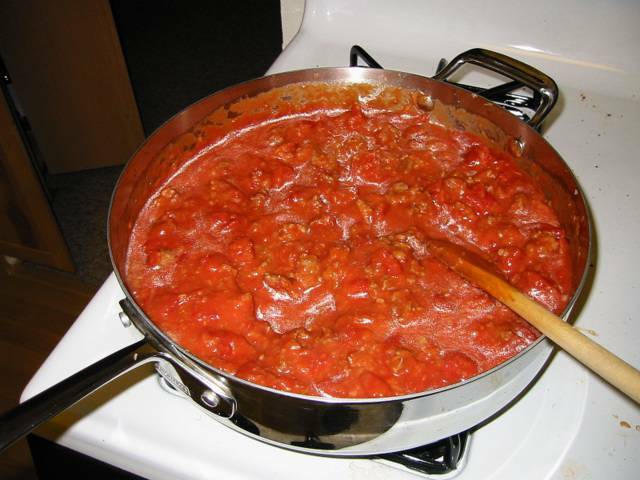 Spoon enough meat sauce to cover the mozzarella and place another layer of lasgna pasta. Repeat with mozzarella, meat sauce, lasagna, mozzarella, and meat sauce. Be careful how much meat sauce you use because I lost track of how many layers I was building and used all the meat sauce - not leaving any to top the final layer. The top layer of pasta goes on the meat sauce, upside down. Cover this layer with the remaining sauce. This is when I realized I didn't have anymore sauce. By not covering this final pasta layer, I was guaranteed a very hard, dry covering that would probably need to be peeled off before eating the lasagna. I'll take pictures of a correctly made lasagna, the next time I make one and repost here. Cover the top layer of red sauce with the remaining mozzarella cheese and then sprinkle the final 1/4 cup of parmesan on top. This lasagna can now be cooled, wrapped and stored in the refrigerator for a couple days or frozen for a month. Before baking, cover the top with aluminum foil. To help prevent cheese from sticking to the aluminum foil, brush or spray some oil onto the foil. Place the lasanga onto the middle rack in a preheated 375°F oven for 15 minutes. I like to place the pan in a baking sheet in case any bubble over occurs. After fifteen minutes have passed, remove the foil and continue baking for 25 more minutes. 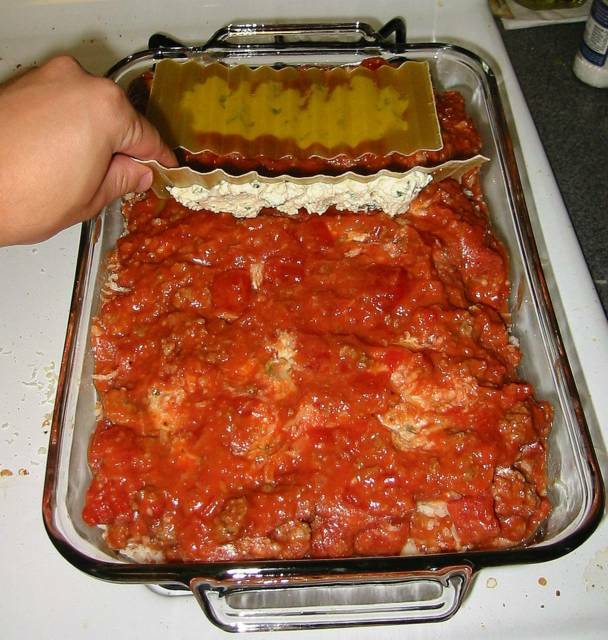 Remove from the oven and allow the lasagna to cool for a few minutes before cutting and serving. stop eating the cattle, f#*ker. More Meat for the People! As to poster #1 above, what about a vegetarian lasagna dish? Cool site. Thanks. Hey, don't use up all the veggies! Do you have ANY idea how much vegitation I need to feed my meat pets before I devour their succulent flesh? I miss the sliced carrots in the meat, and foremost the Bechamel Sauce! It makes me think that the author is American, because lasagna in America has very little to do with the lasagna in Italy and Sweden it seems. I appreciate that there were no mushrooms, however. Lasagna is my favorite dish, but here in USA I almost always get disapointed, my question is when ordering "Does it have bechalme sause? AND NOT MUSHROOMS!". Normally, they never heard the word bechalme, and they put mushrooms in it, then it's not lasagna (for me). For some reason this sort of dish is WAAAY better when twice-cooked. Simply prepare and cook as per the recipie (perhaps reduce the cooking time a little). Then leave to cool. Refrigerate or freeze if neccessary. Then, before serving, cook it again. Microwave, even. To my knowledge there are a couple types of lasagna. In Northern Italy a dish called Lasagna Bolognese is popular with Bolognese meat sauce and bechamel (instead of ricotta). Unfortunately, I don't know how to make this dish in a reasonable amount of time. Check out the latest "Cooks Illustrated" magazine for a Lasagna Bolognese (sp) that's "quick". My read is that it's a couple of hours, rather than all day. But bechamel sauce, et al is time comsuming. A common point of confusion is that lasagna isn't a particular dish, but a form of pasta rather like rigatoni or tortellini. Given some sauce X (pesto, ragu, or spinach with prosciutto and onions), you mix it with bechamel at 3 parts X to 2 parts bechamel (+/- a quarter or so depending on thickness of X and personal preference). Put down a bit of butter and bechamel on the bottom of your pan, put in a layer of noodles, then a layer of the X/bechamel mixture, more noodles, more mixture, etc., trying for at least six layers. Try to finish with a thin layer of mixture to avoid the hard crust mentioned in this recipe. My best guess as to how the form of lasagna prevalent in America came about is that someone who knew a little bit about Italian food ate a lasagna, tried to recreate it, but had to make some guesses: a tomato sauce with meatballs crushed up, and the used of ricotta based filling for tortellini, ravioli, and other more conventional stuffed pastas combined to give this creature. Has anyone created lasagna using an alfredo sauce instead of tomato? Lasagna Stroganoff? I love good lasagna but really don't like tomatoes all that much... If someone has done this, please share! If I get motivated some time when the right ingredients are around, I'll post it. There is a dish popular among the church-luncheon set that uses lasagna pasta, a standard white sauce, mozzarella, and diced chicken. Add spices to the sauce to taste (garlic, salt, pepper, parsley, thyme, etc.). 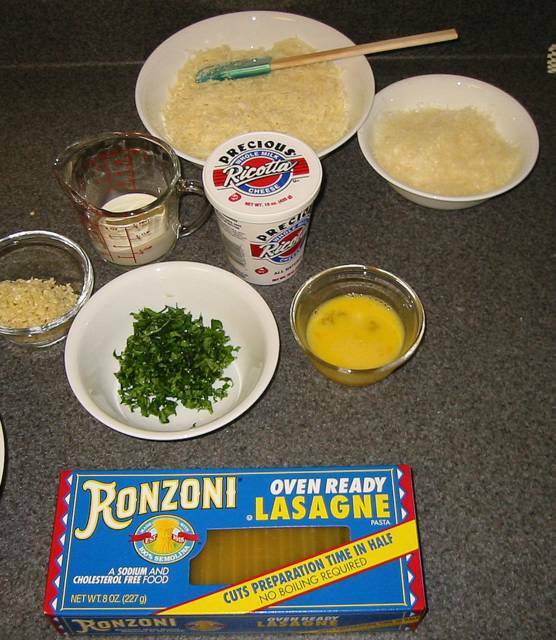 Layer the ingredients like regular lasagna. It's pretty good, if a bit bland. My mother is from Chihuahua, Mexico, and in that region they make enchiladas in layers like a lasagna. Use your regular favorite sauce (green chilis are the preferred ones), white cheese, chicken or beef, onions -- almost anything can be part of the filling. Layer the (corn) tortillas with the sauce and filling mixture. Bake at 350 degrees for 30-45 minutes for a 9 x 13" pan. Your guests will love it. I'm writeing from Florence Italy, ada your blog is delicious for me. BUT: nobody in Italy uses ricotta in a lasagna!!! Would you like to receive an ORIGINAL recipe for coocking Lasagna?